No, its not your imagination, this is the same quilt pattern “Ah, Autumn” featured in the three previous blog entries. Of the three previously featured Ah, Autumn handmade quilts, this one looks the most like Harriet Bain’s Ah Autumn quilt starting with the quilt colors. For some reason the quilter has renamed the quilt but all of the basic pattern elements are still there. This is why a quilt pattern can have different names from country to country or even region and down within a country. The one interesting element mentioned in this handmade quilt is the use of Guatemalan fabrics. The handmade quilt border gives this pattern an interesting contrast. It is reminiscent of the leaf pattern found in the rest of the handmade quilt. 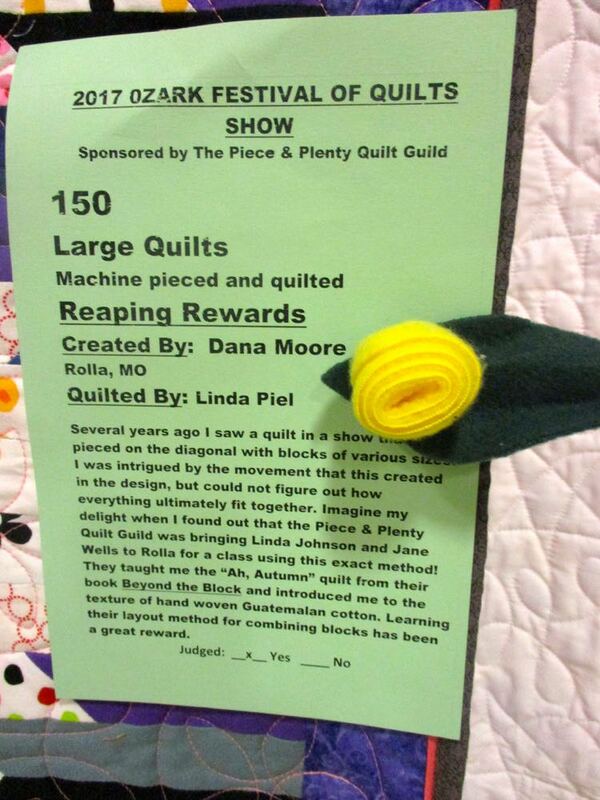 This was another quilt featured at Piece and Plenty’s 2018 bi-annual Quilt Guild show in Rolla, Mo. This handmade quilt story mentions that the Guatemalan cotton has a different texture, something I missed when I was at the quilt guild show. Maybe next year!